Blockchain gaming is the hottest trend in the cryptocurrency space that is rapidly changing the way we game. Each day, new projects and further developments push the envelope on the capabilities and potential of this new paradigm of gaming. Among blockchain game pioneers is Ether Online, a decentralized, massively multiplayer online role-playing game built on top of Ethereum. Ether Online is a fresh take on Ethereum gaming. On April 27, the fantasy MMORPG was broadcast to the public through the commencement of the public Alpha phase. Since then, players have been opening chest, crafting gear, and most importantly, earning ETH. Payments made to purchase unique pets and open chests gets sent to a global jackpot. Each day, 10% of the jackpot is split equally between four players: the two players with the most battle points, as well as two lucky gamers. Currently, close to 2 ETH is awarded each day. On May 17th, Ether Online is set to enter the public Beta stage. With public Beta, a new set of features will be made available to players. Most importantly, PvP arena battles, the core component of gameplay, will be integrated to the game. In PvP, players are matched up against one another, with the victorious party earning an associated number of points. Success in battle is largely determined by the gear of a player- the better gear one has (and therefore higher number of battle points), the stronger they are in the arena. Like the battle points leaderboard, the introduction of PvP is accompanied by a new leaderboard that ranks top players based on their accumulated victory points from battle. Similarly to the battle points leaderboard, top PvP players will be rewarded daily in Ethereum from the global jackpot. By the time of Beta launch, it is expected that the jackpot will eclipse 40 ETH. At 10% payouts each day, that’s 4 ETH, or more than US$3,000, won by participants every single day. On top of these additions, the May 17th Beta also introduces the marketplace features of the game. With the marketplace, players can buy, sell, and trade their virtual pets and gear. This functionality acts as another source of earning- as now players are similarly rewarded for crafting and looting as they are for battle points and PvP victories. On May 11th, Ether Online surpassed Cryptokitties for the top spot for 24h volume for all game dapps. Ether Online is holding its Marketplace Dividends. 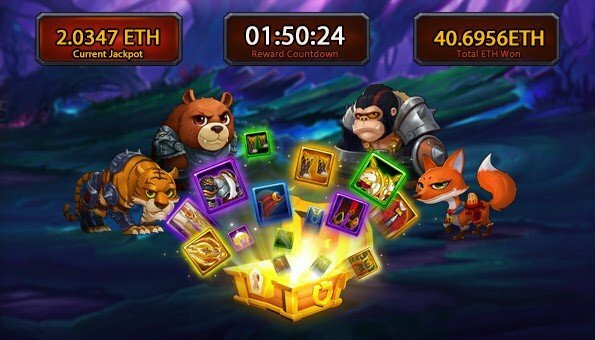 During Marketplace event, players are given the opportunity to purchase market shares (1 ETH equals to 1% and each person can purchase up to 10 shares). 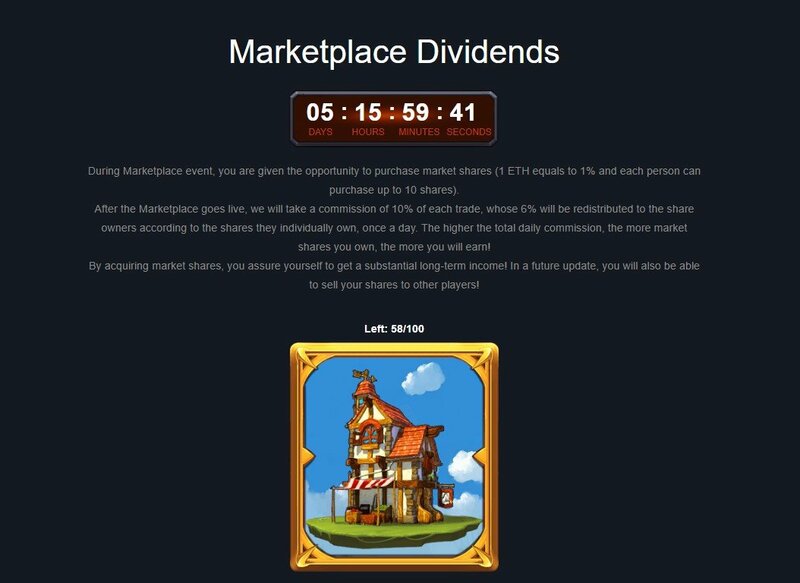 After the Marketplace goes live, we will take a commission of 10% of each trade, whose 6% will be redistributed to the share owners according to the shares they individually own, once a day. The higher the total daily commission, the more market shares you own, the more you will earn! By acquiring market shares, you assure yourself to get a substantial long-term income! In a future update, you will also be able to sell your shares to other players! 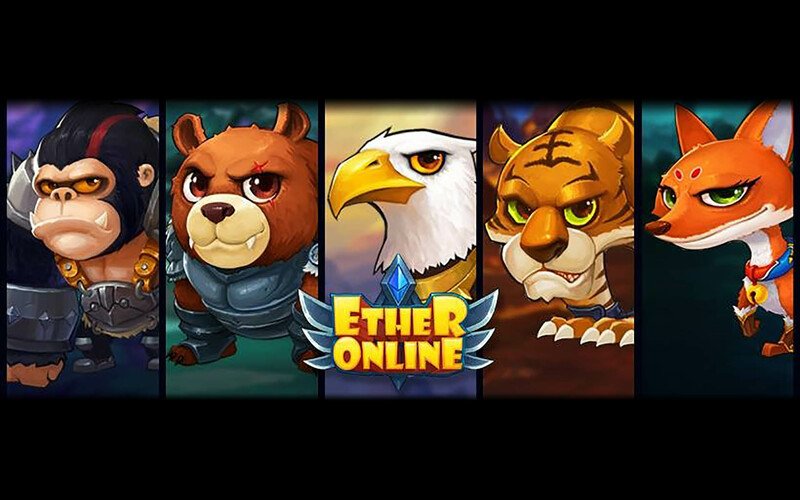 Beyond PC, Ether Online is available for play on mobile devices. In partnership with the Trust mobile wallet and Toshi Ethereum web browser, individuals worldwide can play Ether Online from the convenience of their mobile devices exactly the same as is possible on any laptop or desktop. If you’re interested in Ether Online, spread the word! Ether Online is currently offering a bountiful referral program. Every time you refer a new user, you will receive a 10% dividend on all payments made by the referee, forever. The more you and your friends play, the more you earn.